Baked. COCONUT. Chicken. Tenders. Oh man, oh man…taste buds are definitely freaking out with this one. But then again…anything with coconut is enough for my mouth to transform into a food vacuum. About a month ago, I indulged in a good old date night at Studio Movie Grill and it was fab as always. There’s just something about watching a good movie while simultaneously stuffing your face with good food that immediately sets you into a state of pure bliss. Served up with a side of honey mustard, I’m so happy that it was semi dark in the theater because I was in full on “feeding time at the zoo'” mode. Buuuut then the bloating kicked in. Oh, darn you fried food. It never ever ever fails. Immediately, I came to the realization that I could totally make something similar to curb those coconutty cravings without the post binge guilt. Behold: Baked Coconut Chicken Tenders. Life is officially complete. For this particular recipe, I used whole wheat bread crumbs that I found at my local Aldi. However, if you can only find regular panko bread crumbs, that will work mighty fine. As for the SUPER delish dipping sauce, I took advantage of the fact that mangoes are officially back in season and used them to create something creamy and refreshing. As always, my family was allll over these, and the only regret that I have is that I didn’t make more. Want to see 10 tenders vanish before you can even blink? Place this in front of any coconut loving crowd. Gone in minutes like magic. 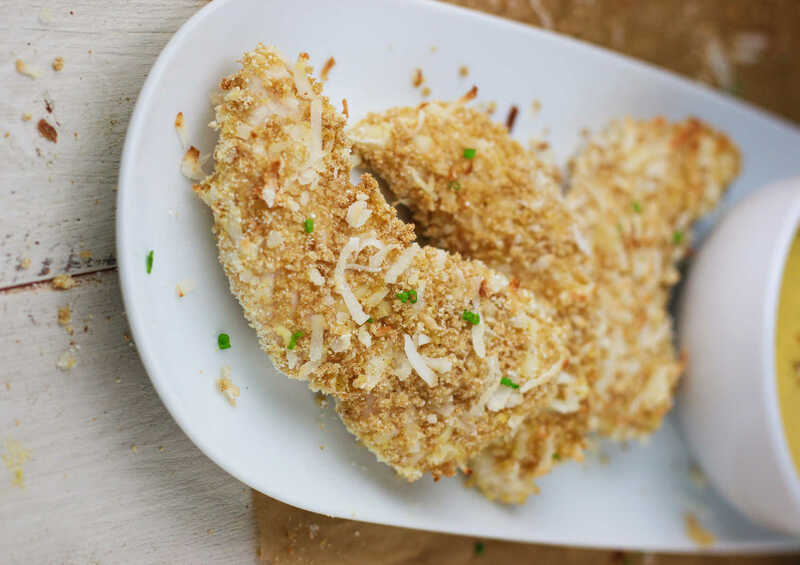 Crispy Baked Coconut Chicken Tenders made with a deliciously creamy Mango Cilantro Dipping Sauce! Preheat oven to 425 degrees F. In a medium bowl, combine the breadcrumbs, coconut flakes, coconut flour, salt and garlic powder. In separate bowl, add the eggs and gently whisk. Line a baking tray with foil and dip each chicken tender in the eggs, then into the coconut breadcrumb mixture. Line the tenders up on the baking tray and bake for 15-20 minutes or until golden brown and centers are no longer pink. While the tenders are baking, add all of the ingredients for the mango cilantro dipping sauce to a blender. Begin with 1/4 cup of water and blend. Gradually add more water until desired consistency has been reached. Serve tenders with sauce and enjoy! COCONUT CHICKEN TENDERS IS LIFE. I'm convinced. Now I'm just thinking of dozens of dipping sauces to dip these fantastic critters in.